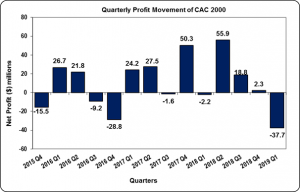 CAC 2000 Limited (CAC), for the three months ended January 31, 2019, recorded revenues of $166.43 million compared to $239.51 million in the prior corresponding period. Cost of sales fell by 29% for the period under review to $111.86 million versus $157.09 million in the same period last year. As a result, gross profit amounted to $54.57 million (2018: $82.42 million), a 34% decline year over year. Loss before taxation and finance cost closed the period at $30.01 million relative to a profit before taxation and finance cost of $586,000 for the corresponding period in 2018. Net finance costs increased by 173% for the period in review to $7.68 million (2018: $2.82 million). The Company highlighted that, “our finance costs also increased as we had budgeted for increased loans to cover short-term working capital needs(particularly covering importation of the outstanding goods in transit.” Interest expenses for the three months ended amounted to $5.20 million relative to $5.64 million twelve months earlier. Interest income and other losses amounted to $73,000 (2018: $266,000) and $2.56 million (2018: gains of $2.56 million), respectively. Loss before taxation closed the period at $37.70 million (2018: $2.23 million). No taxes were recorded for the period as such net loss for the three months ended amounted to $37.70 million (2018: $2.23 million). Loss per share (LPS) for the three months amounted to $0.29 compared to $0.02 in 2018. The twelve months trailing LPS amounted to $0.30. The number of shares used in our calculations is 129,032,258 units. Notably, CAC’s stock price closed the trading period on March 28, 2019 at a price of $12.00. Total Shareholders’ Equity as at January 31, 2019 was $449.84 million compared to $420.86 million a year ago. This resulted in a book value per share of $3.49 compared to $3.26 in 2018.